The earth’s soils are constantly expanding and contracting as they adapt to ever changing temperatures, excess moisture and drought conditions. Varying environmental conditions result in concrete flatwork settling, sinking and failing in response to soil movement and compaction. Settling creates uneven surfaces that often result in dangerous trip hazards at your property. Trip hazards on uneven or raised concrete pose a threat in terms of public safety as well as liability for private property owners, commercial property owners, management companies, HOA’s and municipalities. While trip and fall hazards are a challenge to the general public, they are especially dangerous for the young, the elderly and persons with disabilities. 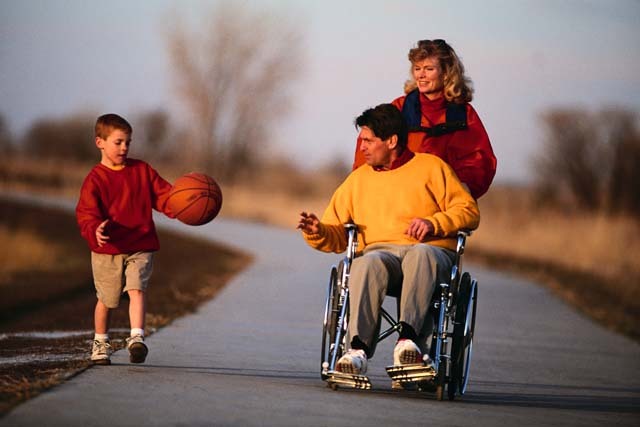 They are particularly dangerous and challenging for those with vision impairments or individuals requiring the use of mobility assistance (canes, crutches, wheelchairs, motorized devices, etc.). The Americans with Disabilities Act of 1990 (ADA), last revised in July 2010 with revisions to the ADA Standards for Accessible Design, is the governing law that prohibits discrimination and ensures equal opportunity for persons with disabilities in employment, State and local government services, public accommodations, commercial facilities and transportation. As it relates to public accommodations and commercial facilities, these areas must be made accessible to those with disabilities. Raised concrete that creates a trip hazard or makes an area impassible prevents access for persons with disabilities and impairments. 303.1 General: Where changes in level are permitted in floor or ground surfaces, they shall comply with 303. 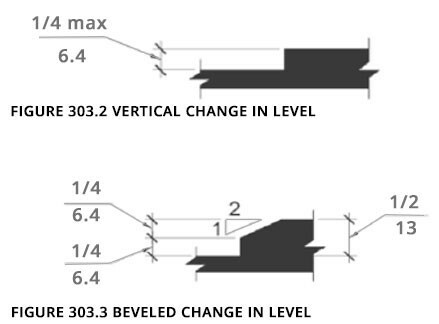 303.2 Vertical: Changes in level of ¼ inch (6.4 mm) high maximum shall be permitted to be vertical. 303.3 Beveled: Changes in level between ¼ inch (6.4 mm) high minimum and ½ inch (13 mm) high maximum shall be beveled with a slope not steeper than 1:2. Advisory 303.3 Beveled: A change in level of ½ inch (13 mm) is permitted to be ¼ inch (6.4 mm) vertical plus ¼ inch (6.4 mm) beveled. However, in no case may the combined change in level exceed ½ inch (13 mm). Changes in level exceeding ½ inch (13 mm) must comply with 405 (Ramps) or 406 (Curb Ramps). 303.4 Ramps. Changes in level greater than ½ inch (13 mm) high shall be ramped, and shall comply with 405 (Ramps) or 406 (Curb Ramps). What does all of this mean? Essentially, the ADA defines a trip hazard as any vertical change over ¼ inch at any joint or crack in the concrete. Because the ADA demands strict compliance and places direct responsibility on the property owners, trip and fall hazards left unrepaired can result in substantial legal liability. Any area that has high pedestrian use further raises trip risks. When it comes to expense, it is always less costly to choose concrete repair over litigation! Should you be found liable for failure to maintain safe pedestrian areas, expenses can include settlements, damages awarded, attorney’s fees and impact on insurance rates, to name a few. Additionally, you will STILL be required to repair the concrete! 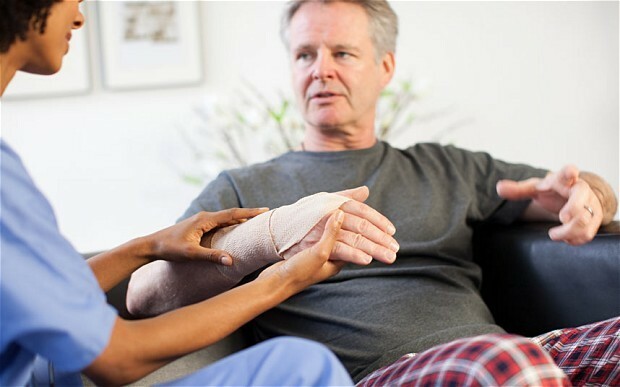 Ignorance of the law is no excuse, which is why we want to make you aware of the most effective option available for repairing the trip dangers that place you at risk for liability of injury, as well as failure to comply with the ADA requirements. Liftech Polyurethane Concrete Raising Low to Moderate; typically half or less the cost of replacing concrete ADA compliant Material fully cured and serviceable after 15 minutes Leaves only 5/8″ patches (size of a penny) that are blended with existing concrete Treats underlying soils!Lasts a lifetime! One and done! Demolition and Replacement High ADA compliant Takes the most time and creates the most mess; environmentally unfriendly Brand new concrete Usually doesn’t treat underlying soil issues; can fail again. 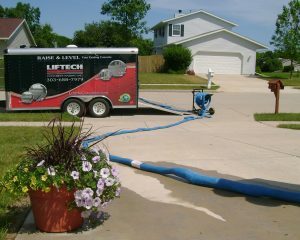 Liftech’s Concrete Raising technology consists of an environmentally-friendly liquid polymer foam that is injected through 5/8” size holes under the concrete and into the loose, unstable soils below. Through a chemical reaction the high density foam expands to stabilize the loose soils and lift the fallen concrete – creating a light weight, impermeable pressure barrier under the concrete. After approximately 15 minutes the polyurethane is fully cured and ready to return to service. The small penny-sized drill holes are filled with cementious grout to match the surrounding concrete. Our polyurethane only weighs about 2 pounds per cubic foot of material which doesn’t add any additional, unwanted weight to an already failing substrate. The polyurethane foam is an inert, non-toxic and environmentally safe material that is made from 100% recycled materials. It is impervious to moisture or decay ensuring that your repair will last a lifetime! The average life cycle of the concrete is extended at a fraction of the cost of replacement.